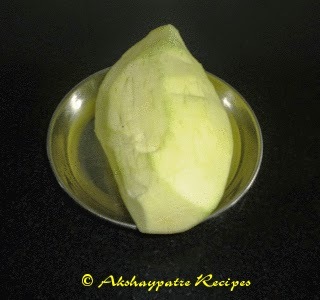 Wash the raw mango and pat to dry. Peel the raw mango with a peeler. 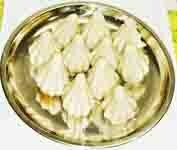 Cut it into small pieces and discard the seed. 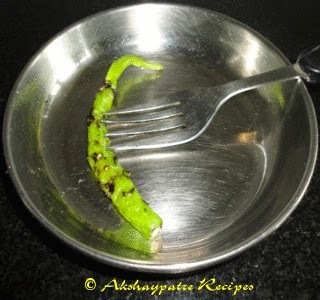 Roast green chillies directly on flame using a fork. Chop the roasted green chillies into small pieces. 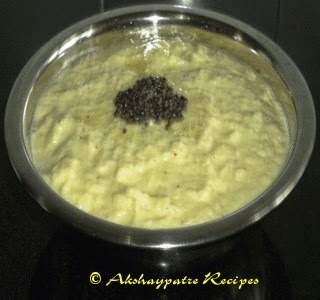 Grind together the grated coconut, roasted green chillies, jaggery, salt and raw mangoes to make a smooth chutney.Use drinking water to grind. 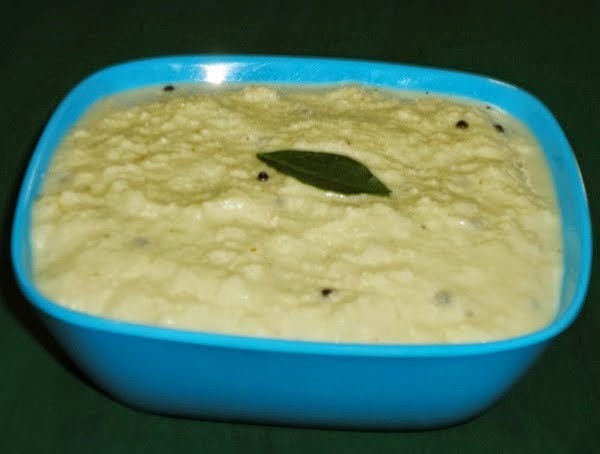 Transfer this chutney to a bowl. In a small frying pan heat a tsp of oil and add mustard seeds and a pinch of hing. Allow them to crackle. Pour this tempering over the chutney. Serve 2-3 tbsp of chutney with bhajjis, samosas, vadas, idlis, dosas, rotis. or rice and curry. 1. 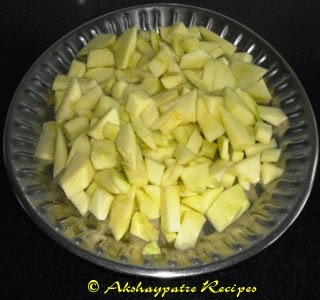 Wash the raw mango and pat to dry. 2. 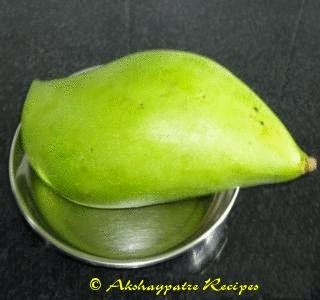 Peel the raw mango with a peeler. 3. Cut it into small pieces and discard the seed. 4. Roast green chillies directly on flame using a fork. 5. Chop the roasted green chillies into small pieces. 6. 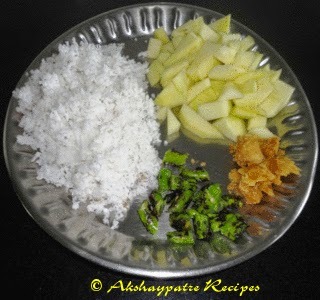 Grind together the grated coconut, roasted green chillies, jaggery, salt and raw mangoes to make a smooth chutney.Use drinking water to grind. 7. Pour the tempering made with mustard seeds and hing on it. Mix well. 8. 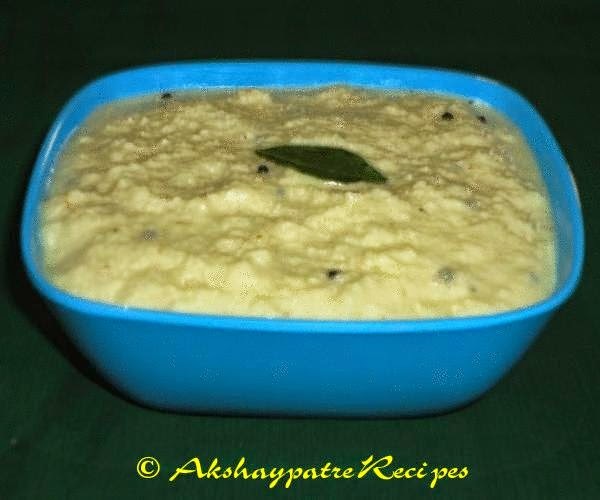 Serve 2-3 tbsp of mavinakayi chutney with choice of your main meal. a different chutney from the usual ones,quite healthy and yummy too.